Using a screwdriver, pry out the underdrive clutch flange snap ring. Remove the flange, 3 discs and 3 plates from the underdrive clutch drum. Place sst on the clutch balancer and compress the spring with a press. Using a snap ring expander, remove the snap ring. Stop the press when the spring sheet is lowered to a position 1 to 2 mm (0.04 To 0.08 In.) From the snap ring groove. This prevents the spring sheet from being deformed. Do not expand the snap ring excessively. Remove the clutch balancer from the underdrive clutch drum. Remove the piston return spring from the underdrive clutch drum. Install the underdrive clutch to the transaxle. Be careful not to damage the oil seal rings. 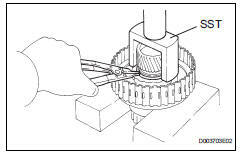 Holding the underdrive clutch piston with your hand, apply compressed air (392 kpa, 4.0 Kgf/cm2, 57 psi) to the transaxle case to remove the underdrive clutch piston. Install a dial indicator as shown in the illustration. If the pack clearance is not as specified, inspect the discs, plates and flange. Check to see if the sliding surface of the disc, plate and flange are worn or burnt. If necessary, replace them. If the lining of the discs is peeling off or discolored, or even if a part of the printed mark is defaced, replace all discs. Before assembling new discs, soak them in atf for at least 15 minutes. Using a caliper gauge measure the inside diameter of the underdrive clutch drum bush. 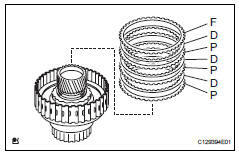 If the inside diameter is greater then the maximum, replace the underdrive clutch drum sub-assembly. Using a vernier caliper, measure the free length of the spring together with the spring seat. Coat the underdrive clutch piston with atf, and install it to the underdrive clutch piston drum. Install the piston return spring to the underdrive clutch drum. Install the clutch balancer to the underdrive clutch drum. Be careful not to damage the lip seal of the clutch balancer. 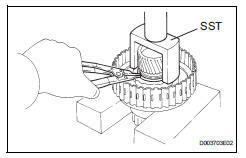 Place sst on the clutch balancer and compress the piston return spring with a press. 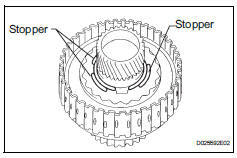 Using a snap ring expander, install the snap ring to the underdrive clutch drum. Be sure the end gap of the snap ring is not aligned with the clutch balancer's claw. Stop the press when the spring sheet is lowered to a position 1 to 2 mm (0.039 0.078 In.) From the snap ring groove. 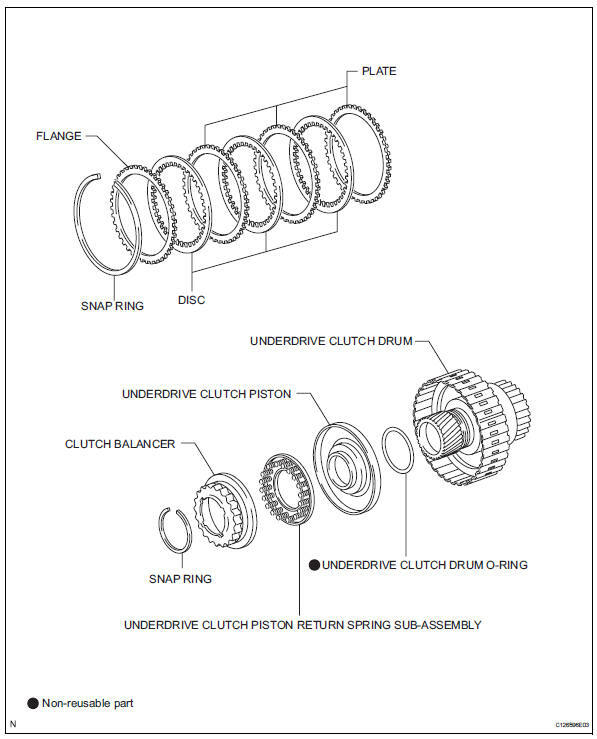 Set the end gap of the snap ring in the underdrive clutch drum shown in the illustration. The end gap of the snap ring should not coincide with any of the stopper. Coat the new o-ring with atf, and install it to the underdrive clutch drum. Install the 3 plates, 3 discs and flange to the underdrive clutch drum. Using a screwdriver, install the underdrive clutch flange hole snap ring. Check that the end gap of the snap ring is not aligned with one of the cutouts. Set a dial indicator as shown in the illustration. Measure the underdrive clutch piston stroke while applying and releasing compressed air (392 kpa, 4.0 Kgf/cm2, 57 psi). 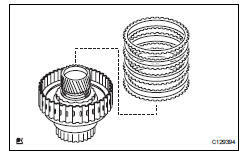 If the pack clearance is less than the minimum, parts may have been assembled incorrectly, so check and reassemble again. If the park clearance is not as specified, select another flange. There are 3 flanges in different thickness.